Imagine it's the sixteenth century, and you're a foot soldier in an army at war with England. In the heat of battle, you look up to see a fat man on top of a gigantic horse. He's wearing a sparkling suit of expensive armor--complete with a horned helmet unlike anything you've encountered before. And he's coming right at you. Of course the owner of the helmet shown above never saw battle. Henry VIII was more of a lover than a fighter (haha). In a way it's too bad. 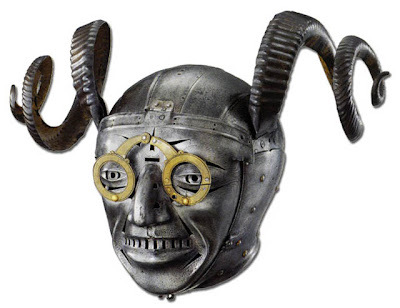 Suits of armor were designed to strike fear in the hearts of opposing soldiers, and there's something about this particular helmet that's so incredibly creepy that it would certainly have given his troops an advantage. I'm not a huge fan of armor, but the Royal Armouries in Leeds has a pretty cool collection. Be sure to check out the elephant armor! That thing is really bizarre. Wouldn't that thing hurt your head? cool...i was only in Leeds a couple of weeks ago too!! i would love to visit this. I'm sure that mask would make any sixteenth century kid paranoid for life.